Samsung Galaxy Tab review | What Hi-Fi? For when a smartphone screen is too small and a laptop too cumbersome, enter the tablet – a touchscreen multi-tasker to keep you entertained or informed anywhere. 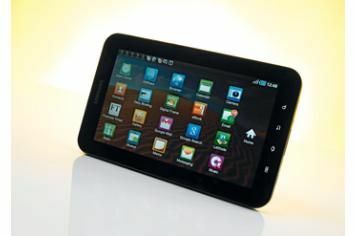 Samsung's Galaxy Tab is a smaller yet far more feature-packed alternative to Apple's iPad. While the 9.7in-screened iPad comes with only wi-fi connectiviy as standard – 3G models cost extra – the 7in-toting Tab offers wi-fi, 3G and a full set of phone features. The spec one-upmanship continues with both still and video cameras, including a forward-facing lens for video calling. All very good stuff. The smaller form factor makes this more portable than some; it's a one-hand hold. And it's fairly simple to use. There's no matching its Apple rival for slickness, but you can drag and drop a far wider range of music and video formats onto the Galaxy Tab and be ready to play without much fuss. It's best to use your own content, because there isn't the download support you'd want. Samsung has partnered with 7Digital for music and Acetrax for movies, but neither the choice nor quality impresses. This highlights one of the Galaxy Tab's biggest hurdles: its Android operating system currently isn't geared up for tablets. The paucity of decent apps is painful. Yes, there's a version of Angry Birds, and the Financial Times app is well thought out, but too many other apps from the scarce selection simply don't scale – or suit – the larger screen or greater functionality. The Skype app, for example, supports only voice calls; you'll need to find alternative means of using the video-call capabilties. But these are more criticisms of Android than the Galaxy Tab. In use, the Samsung impresses with the quality of its bundled in-ear headphones (complete with in-line mic) – leagues ahead of Apple's woeful buds. Music sounds weighty and detailed, but can't quite equal the iPad for all-round musicality and integration. And it's a similar story with movie playback, where the Galaxy Tab can't match the smoother motion, extra detail (and inches) and deeper blacks available on the Apple. Even more stark is the comparison to the Award-winning Galaxy S smartphone, which boasts a superior, AMOLED screen. Still, it entertains. The Tab's screen is also more reflective than rivals', and runs best with Powersave mode switched off – though this means you'll eat into the (generous) typically eight-hour-plus battery life. Despite not hitting class-leading status, this is a product that will find many fans. If you've not spent long with either Apple's iPad or Samsung's own Galaxy S. you'll be mightily impressed, with no comparisons to have you doubting the Galaxy Tab's all-round appeal.